The year 2017 brought Donald Trump's first pitch in our conservation stadium—and it was a curve ball. Instead of the usual rogues gallery character like the other cabinet members Trump was assembling, the first anti-conservation villain we faced from team MAGA appeared to be of an entirely different profile: Square-jawed, an ex-Navy Seal who loved to hunt and fish and camp. And an Eagle Scout. But we soon learned that Rep. Ryan Zinke of Montana was cut from far different cloth than appeared. Our first crusade of the year was an act of resistance against Zinke's nomination to the post of Secretary of the Interior, an official said to be regarded in the American West as more powerful than the President. Beyond highlighting Zinke's track record it was more broadly apparent that we would need to wage a focused fight to protect America's public lands—our national forests, parks, and wilderness areas—from what probably was to be the most anti-environmental government in U.S. history. We brought grassroots pressure to oppose efforts to make federal land transfers to the states easier, to allow the popular and cost-effective Land and Water Conservation Fund to die, and to weaken the Antiquities Act of 1906. Please donate generously to allow us to keep pressing these and other campaigns forward! In April Trump ordered a "review" of national monuments designated since 1996 and larger than 100,000 acres. This brought 27 monuments under scrutiny including seven in California—Berryessa-Snow Mountain, Cascade-Siskiyou, Giant Sequoia, San Gabriel Mountains, Carrizo Plain, Mojave Trails, and Sand to Snow (the first four are heavily forested). One fire alarm followed the next. In June the timber industry "wish list" bill was introduced, disingenuously named the "Resilient Federal Forests Act," H.R. 2936. It would expose millions of acres of protected roadless areas to destructive logging and road building, at the same time reallocating funding from environmental restoration to timber extraction. And in October came another deceptively named bill—H.R. 3990, the "National Monument Creation and Protection Act." It would do just the opposite, imposing severe restrictions on the creation of future monuments— which often have become some of America's most-beloved national parks—as well as placing current monuments at risk. Meanwhile, away from Washington there were other matters on our doorstep. By May proponents of the 2016 Napa County Water, Forest, and Oak Woodland Protection Initiative had exhausted their appeals in the courts, their initial measure having been qualified then sidelined on a technicality. We were instrumental in subsequently qualifying the re-drafted measure, now headed for the June 2018 ballot. Mostly, the strategy employed by anti-conservationists in the Trump administration has been one of stealth: Attempt swift rule changes or passage of bills without normal hearings or transparency; try to jam them through before the public finds out. So far, mostly, this strategy hasn't worked, and that's because groups like Forests Forever have exposed these maneuvers quickly and organized large-scale public counter-pressure. We have helped limit the scope of Zinke's bogus monument "review" and re-galvanized communities to speak out in favor of their protected and beloved public lands. After Forests Forever and other groups waged a letter-writing campaign in favor of leaving the monuments alone, at this writing only one California monument—Cascade-Siskiyou on the Oregon-California border—is apparently under recommendation for shrinkage. Beyond the measures just discussed there is much more we have been working on. We are a key player in the Campbell Creek Planning Watershed Pilot Project, which got underway last December after our long insistence. The desired outcome of this project, taking place in a watershed near Fort Bragg, will be nothing less than to lay a foundation for reforming the state's broken logging rules, making them both more cost-efficient and environmentally effective. We recently notched a victory at the state level in resisting federal public lands handover schemes when Gov. Jerry Brown on Oct. 6 signed S.B. 50 into law. This new statute will help put the brakes on giveaways by authorizing the state Lands Commission to exercise a right of first refusal on any federal land transfers proposed in California. If you wrote or phoned the legislature or governor on S.B. 50, thanks! While the world and national stages currently present a terrifying spectacle we clearly see reason for hope: At the city, county, and state levels ordinary people are getting organized, raising their voices and making positive changes—putting the brakes on threats to our quality of life, voting thoughtful and ethical new people into office, using the courts to check the juggernaut of destruction, and making a ruckus in the streets and halls of government. And as you know, California is the epicenter of this movement right now. The Golden State is leading the fight for the planet and we're making headway. Now rounding its 28th year of existence, Forests Forever is in a better position than ever before to press forward. 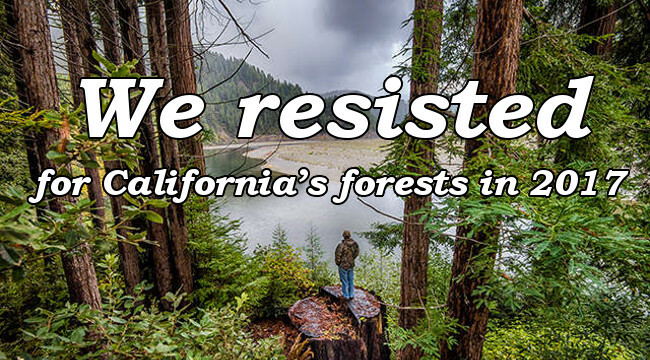 We remain the only NGO that works all year long to defend and restore California's forests and wildlife through broad-based grassroots advocacy. What's in store for 2018? Read about some of what we see ahead. We have seen election results in the past that seemed to spell certain doom for the planet we all share. Not to say we came through unscathed then, far from it. But our system held up better than many of us expected. We survived the presidency of Ronald Reagan, who famously said, "A tree is a tree. How many more do you have to look at?" And his infamous Interior Secretary James Watt: "If the troubles from environmentalists cannot be solved in the jury box or at the ballot box perhaps the cartridge box should be used." George W. Bush's revolving door between industry lobbying firms and environmental positions in his administration spun at blinding speed—and he greatly widened the growing chasm between science and public policy making. We can make it through the Trump era too. We have only to focus, remember to take care of ourselves... and organize relentlessly. Your continued loyalty and financial support will give us the staying power to see the job through! Please give generously today!